There’s a great debate that has entered the fitness world and many of us are confused what side to take. To eat or not to eat before a workout, that is the question. Even seasoned fitness gurus ask themselves: Should I eat before working out? The answer: Yes. Your body needs fuel and nutrition to get through your workout. How is your body supposed to function at its peak ability if it’s running on empty? However, you shouldn’t eat just anything. There are certain foods that will slow you down and make your workout more difficult. They’ll make you feel tired and sluggish and you won’t get the workout you were hoping for. On the other hand, there are foods that will pump you up and make your workout the best it can be! A mix of complex and simple carbs ensures you’re hitting the gym full force and healthy sugars from fruits provide you with the energy boost your body craves pre and during your workout. As mentioned above, some foods are harder to digest than others, and these will make you feel sluggish and slow throughout your workout. Stay away from foods like pasta, potatoes and chocolate, that are high in gluten and lactose, which pose digestive problems for many people. The last thing you want is to be in the middle of your spin class with what feels like a pit in the middle of your stomach. Working out on an empty stomach can result in low blood sugar, which can lead to feelings of dizziness and fatigue. That’s pretty much the opposite of how you want to be feeling when you hit the gym, so make sure you’re getting the fuel you need! 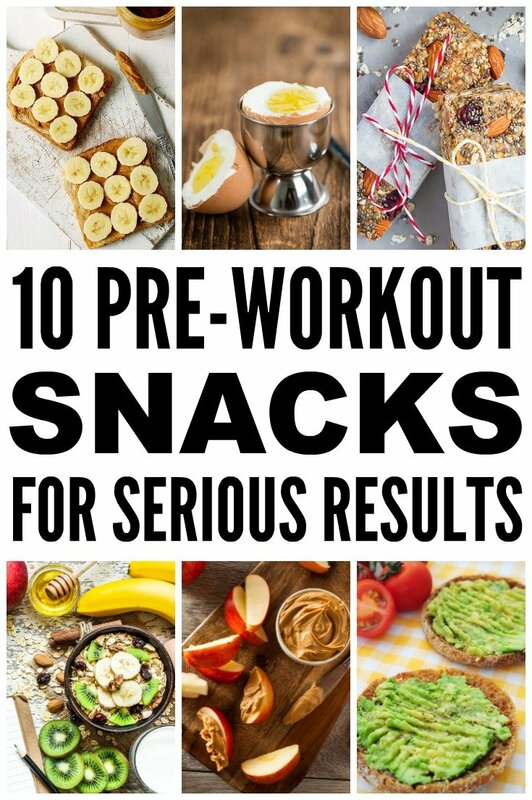 And don’t forget, these are pre-workout snack ideas. If you’re really hungry, stick to a bigger meal 2-3 hours before your workout, but right before your workout you can eat these nutritious snacks! So what should you eat before working out? Here are 10 snacks to make sure you’re totally fueled and energized before you exercise. A fruit and protein smoothie is the perfect pre-workout meal. I love using peanut butter in my smoothies for protein, but you can also use protein powder! Blend it up with your favorite fruits to give you a boost in energy and pack it with you to sip on the go! Oats are slow digesting carbs, which means they’ll release sugar slowly into your blood stream giving you consistent energy throughout your workout! Oats are also great for prepping your muscles before you exercise. Whip up some oatmeal and add in some fruits for extra fuel! High in omega-3 fats, chia seeds will keep your energy going. They’re great to eat before a long workout to sustain your fuel! They’re also packed with protein and antioxidants, which are nutritious and beneficial for your body. Put them in a smoothie or on top of some yogurt and off you go! Whole wheat toast is awesome because it’s a healthy carb and easy to digest. Peanut butter is rich in protein and offers a great pre-workout boost. Just make sure it’s all-natural peanut butter and not the peanut butter packed with sugar. Bananas are high in potassium, and since your potassium levels drop when you sweat a lot, fill up on them before you exercise! Mix them all together and you have a killer pre-workout snack. Eggs are high in protein and low in fat, giving you the best of both worlds. I often hard boil a bunch of eggs at the beginning of the week and pop them in the fridge to grab as I need them. They’re one of my favorite pre-workout snacks and they always ensure I don’t feel hungry mid sweat sesh. Almond butter is a great source of protein, plus it boosts your energy and will keep your tummy satisfied throughout your workout. Apples are chockfull of vitamins and antioxidants so they’re perfect for keeping your energy levels up as well. We’ve already talked about the benefits of whole what toast, but avocados are up there too. With potassium and magnesium, they enhance your muscle function, plus they’re easy to digest and they’ll keep you satisfied while you exercise! Greek yogurt is smooth on your stomach and the seeds and nuts from the trail mix will prevent your insulin levels from dropping during your workout. The dried fruit will also give you a nice little boost! An energy or granola bar acts as a satisfying pre-workout snack. If you need something quick to eat between the office and the gym, grab a bar and eat it on the go. Stay away from bars that are really sweet or filled with chocolate, and stick to bars with protein and granola/oats. They’ll ensure you aren’t exercising on an empty stomach, without making you slow and sluggish. If you’re heading to the gym and low on energy, you’ll probably feel like you need a quick pick me up. Don’t reach for candy or gummies, no matter how tempting it is. This will lead to a sugar crash and won’t do anything to help your work out! Instead, eat some applesauce. It’s super easy to digest and will give you the natural sugars you need for a boost of energy! If you’ve been wondering whether to eat before your workout, the answer is yes! Eat nutritious, healthy carbs to keep your energy up throughout your workout! If you want to help others answer the question: Should I eat before a workout? Please share this post on Pinterest! And if you’re looking for more health and fitness tips, please follow our Fitness board on Pinterest!